Cook quick and tasty meals for the whole family with Kealive sandwich maker. 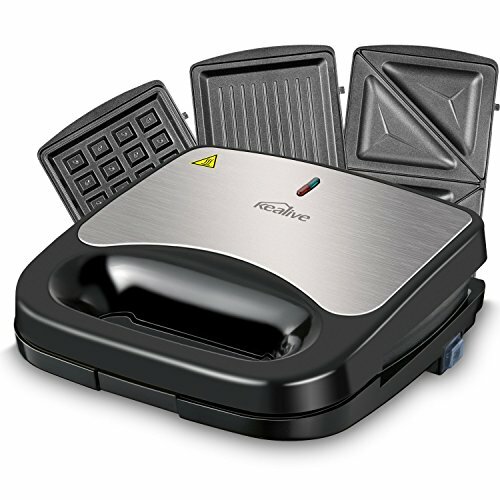 Sandwich maker comes with 3 switchable non-stick coating plates for making tasty sandwiches, crispy waffles, or grilled meats, etc. This device also offers safety, stability, and comfort with its cool-touch handle and anti-skid feet. you can go from plugging in the grill to enjoying a tasty meal in just 10 minutes! Apart from making sandwich, the machine is designed to make crispy waffles, grilled meats, etc. Perfect for breakfast, lunch, dinner making and delicious meals at any time of the day. Powered by 120V and 750W, it works fast. Enjoy great grilled food any time of the year and you won't be late for work. Simple design for easy operation and cleaning!  3 in 1 Anti-stick Plates: It comes with 3 interchangeable plates (sandwich, waffle and grill plates maker) ,perfect for classic larger sandwiches, as waffle iron, steaks etc; All it takes is a simple switch of the reversible cooking plates.  Safe & Stable: Designed for max safety, it includes a cool touch handle for safe and comfortable use, a heat-resistant, stainless steel exterior, LED indicator lights, and non-slip feet to keep it in place.  Easy to Clean: Nonstick Anodized Aluminum coated plates keep your food from getting stuck to the griddle, the non-stick plates can be removed and are dishwasher-safe for easy cleaning.  Fast & Easy to Operate : This 750-watt panini grill takes only 3 minutes to reach the cooking temperature of 392℉, Easy and fast operation for a quick meal, summer party or a family event. This unit is perfect for making breakfast, lunch, dinner and more!